How will we accommodate 9 billion people in a sustainable way without exhausting or rendering unusable earth’s finite resources? Food should be produced at a local level People should eat real food, not processed food. Smarter ways of farming sustainably. Local does not equal sustainable Real is relative. At 9 B we may all be eating crickets and bio-protein. 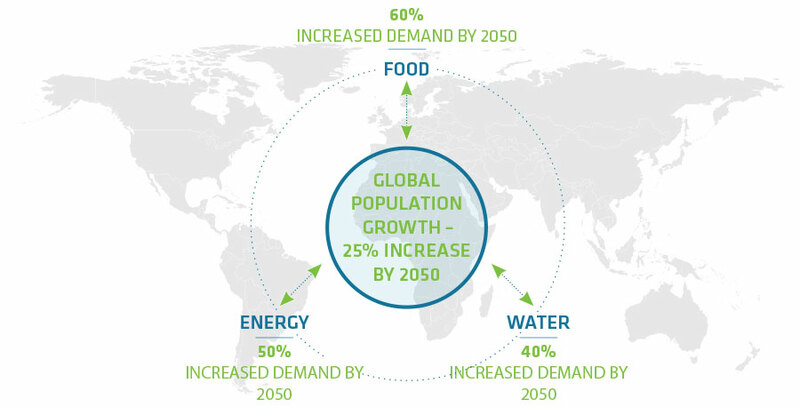 Population growth is the most significant driver of the demand for food. As of July 2015, the world population stood at 7.3 billion and is estimated to grow to at least 9 billion by 2050. In the current ‘business as usual’ mode, feeding a population of 9 billion would mean a dramatic simultaneous increase in the need for food, energy and water in the next decades. 60% more food, 50% more energy and 40% more water by 2050. United Nations, Department of Economic and Social Affairs, Population Division. 2015. World Population Prospects: The 2015 Revision. Working Paper No. ESA/PWP.241. The Future of Food has been produced by Future iQ as a foresight research paper. It examines a range of critical catalysts of change relating to the global food supply chain, and the potential impacts upon human health, the environment and food security.